This is the first set from this new Russian company, and a most unusual and interesting subject they have chosen. The set was manufactured in Russia, where the cost of making the mould is based on the number of figures, not the number of different poses as it is in Western Europe. Consequently most sets have multiples of the same pose, and Russian sets like this can afford to have very many more poses. Orion has taken advantage of this to produce a wide range of figures, which is appropriate as pirates did not act in synchronised blocks like regular soldiers. The poses chosen are great fun, and include using a variety of weapons, digging for treasure, moving stores about, drinking (particularly important), firing the cannon and abusing captives. Also included is a skeleton, perhaps the last remains of a man shipwrecked long ago or, more likely, the displayed remains of a pirate who was caught and had to face the consequences of his actions. Many of these poses are much the same as and inspired by old Marx 'Warriors of the World' poses, which were produced in a larger scale. Costume is of course non-uniform but looks authentic, and the figures look natural. There is a rather different quality here compared to the major manufacturers. The surface of the figures is a little irregular, and there are no completely smooth areas, so there is a slightly unpolished feel to the set. That said, clothing and human skin is never 'polished' anyway, so it could be argued that this is a good characteristic. In any event, such a difference would disappear after painting. Flash is minimal, and the whole set is very well executed. Orion has established a reputation for introducing originality and humour into their products, and this set is a splendid achievement. The final figure is a joker figure, which was not included in the original release and only appears in a limited quantity of later releases. 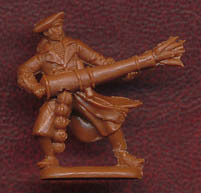 He is a man in a very flattened tricorn and a long coat shooting from the hip using a cannon that has been adapted to take cannonballs from a belt fed in at the base. This sort of automatic fire would fill any target with absolute terror, so it is just as well that it is fantasy, but a fun figure nonetheless.